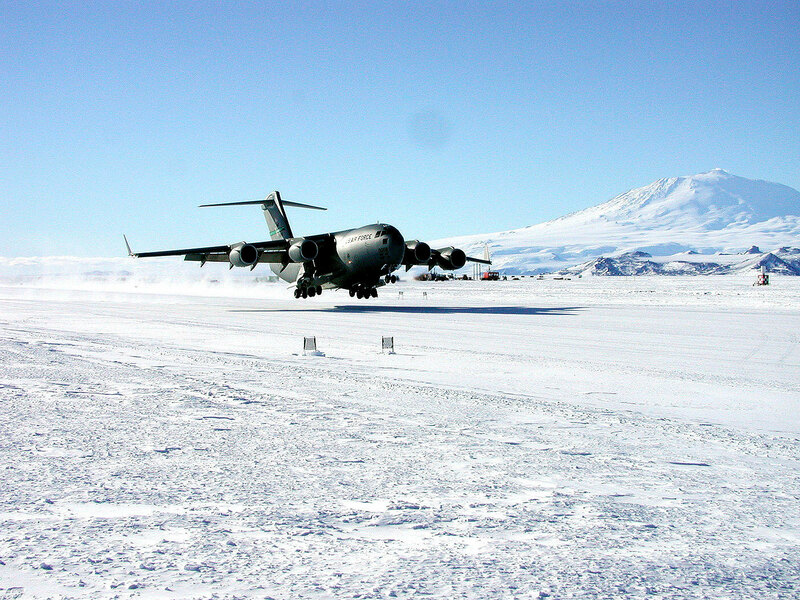 The U.S. Air Force has certified a newly constructed glacial ice runway near Antarctica's McMurdo Station as capable of handling large military cargo jets. The certification marks an important improvement in the U.S. Antarctic Program's (USAP) ability to support science research for the National Science Foundation on Earth's southernmost continent. 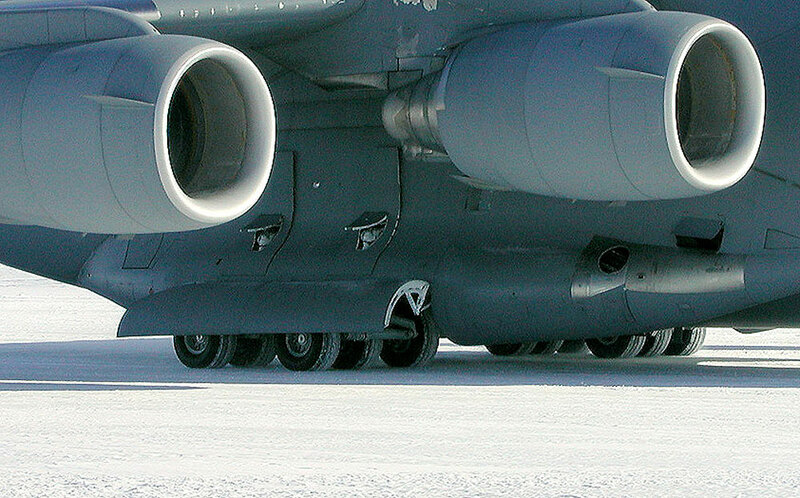 Preparation of the runway pavement required the use of 100-ton pneumatic tire rollers to compact a thin snow cover, turning the snow into white ice, a material sturdy enough to handle four-engine military transport aircraft. The addition of this white ice pavement allows all-season landings of wheeled aircraft in the Antarctic for the first time in history. Currently, ski-equipped LC-130 Hercules cargo aircraft flown by the New York Air National Guard transport much of the cargo and many of the passengers to Antarctica. The new runway greatly enhances airlift capabilities to support USAP activities. 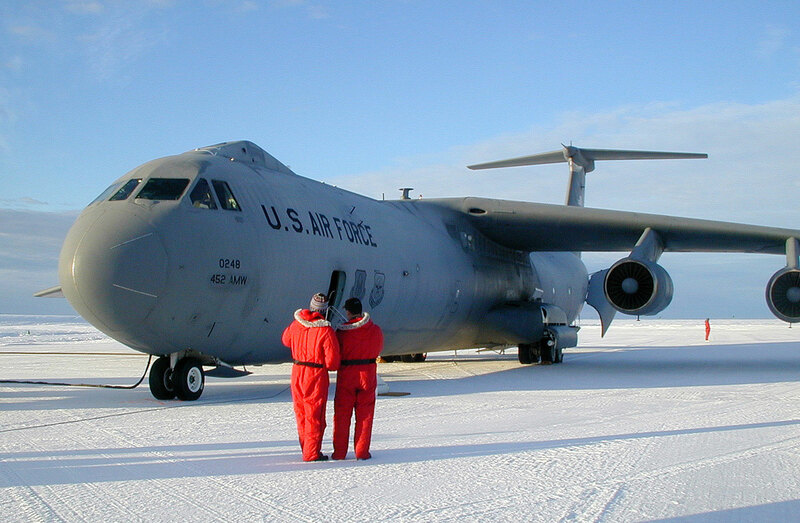 The newly developed compaction process protects the runway from sun damage while having the structural strength necessary to withstand the stresses imposed by the landing of large aircraft such as the C-5 Galaxy, one of the world's largest aircraft; the C-17 Globemaster, the newest air force cargo plane; and the older C-141s. Without a cover of snow as protection, the warm temperatures and high sun angles during the height of the Antarctic summer would have damaged the runway. Prior to the U.S Air Force's certification of the Pegasus runway to handle the larger cargo aircraft, wheeled aircraft were able to land on the continent only very early and very late in the research season on runways that at other times of the year are useable only by ski-equipped planes. The principal austral summer research season begins in October and ends in February. The National Science Foundation operates the U.S. Antarctic Program, which coordinates almost all U.S. scientific activity on the continent. A U.S. Air Force C-17 cargo aircraft lands at Pegasus in February. Photo credit: Dave Berry/Raytheon Polar Services. Measuring the compacted snow with a ruler. 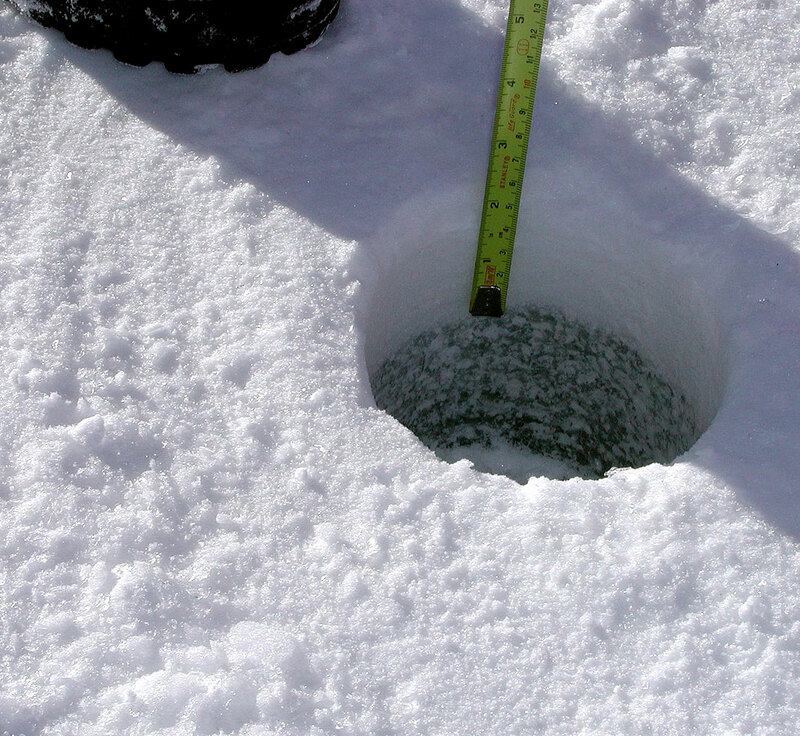 Ice surface can be seen at the bottom of the hole. 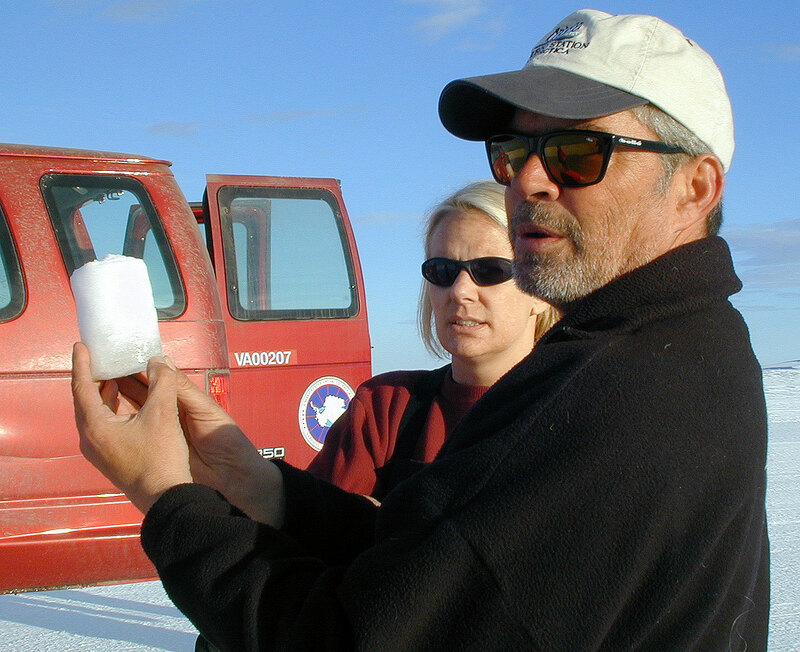 Gary Cardullo, the U.S. Antarctic Program's airfield manager, holds a piece of core drilled from the ice runway showing layers of compacted snow on top of ice. A C-141 cargo plane on the Pegasus runway near McMurdo Station, the National Science Foundation's logistics hub in Antarctica. NSF runs the U.S. Antarctic Program, which coordinates almost all U.S. scientific research on the southernmost continent. Engineer George Blaisdell (seated) checks on the condition of the surface of the runway at Pegasus runway. 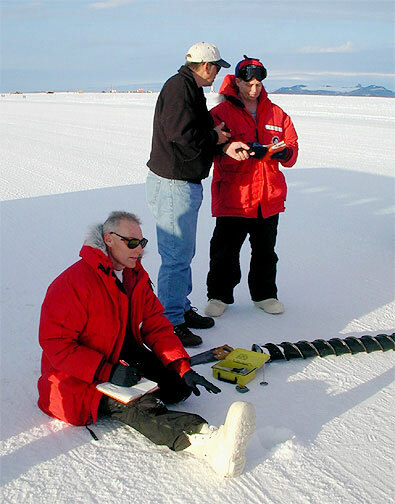 The drill at the right of the picture is used to take ice cores to check on the compaction on the snow surface. The wheels of a U.S. Air Force C-17 rest comfortably on the surface of the Pegasus runway. http://www.af.mil/news/factsheets/C_17_Globemaster_III.html; on the C-5, http://www.af.mil/news/factsheets/C_5_Galaxy.html; and the C-141, http://www.af.mil/news/factsheets/C_141B_Starlifter.html.